The good part about hiking through three days of persistent rain is that it grants ample opportunity to learn the efficacy of your rain gear. This is precisely the hand I was dealt when trekking through Shenandoah National Park earlier this year, while carrying Montbell’s new Convertible Rain Jacket and Convertible Rain Pants. Admittedly, I was originally a bit skeptical about these pieces; the convertible feature seemed gimmicky. After less than an hour of use, I was a believer. The zip-offs sleeves and lower-pant legs are like pit-zips / ankle zips on steroids. 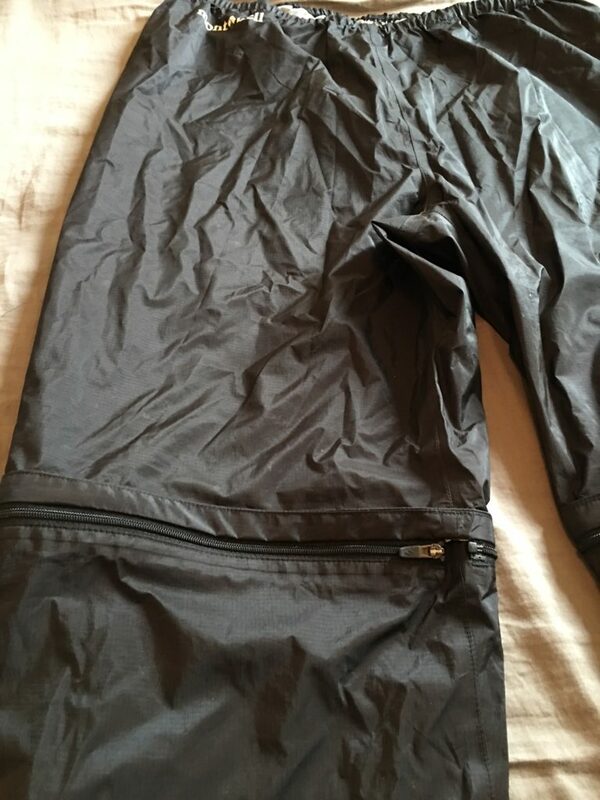 I tested these in temperatures ranging from a very muggy 75-degrees to the low 50’s, and was able to adjust the zippers to maintain a comfortable core temperature throughout, and remaining dry in the process (which is saying a lot, because I’m a sweaty monster). Whether it was a driving cold rain on a descent or a light mist during an afternoon climb, a quick zip open or close was the fix. The convertible feature isn’t perfect (I touch on its faults in the Cons section below), but it’s certainly an improvement over traditional rain jackets / pants. The Convertible Rain Jacket and Rain Pants would be especially useful in the context of a thru-hike, as rain gear is often the de facto town uniform before and/or while dirtier hiking clothes are being laundered. Hiking across town in a full rain jacket and pants can be painfully hot during the warmer months. Zipping down to short sleeves and shorts would be a much cooler (literally and perhaps somewhat figuratively) alternative. 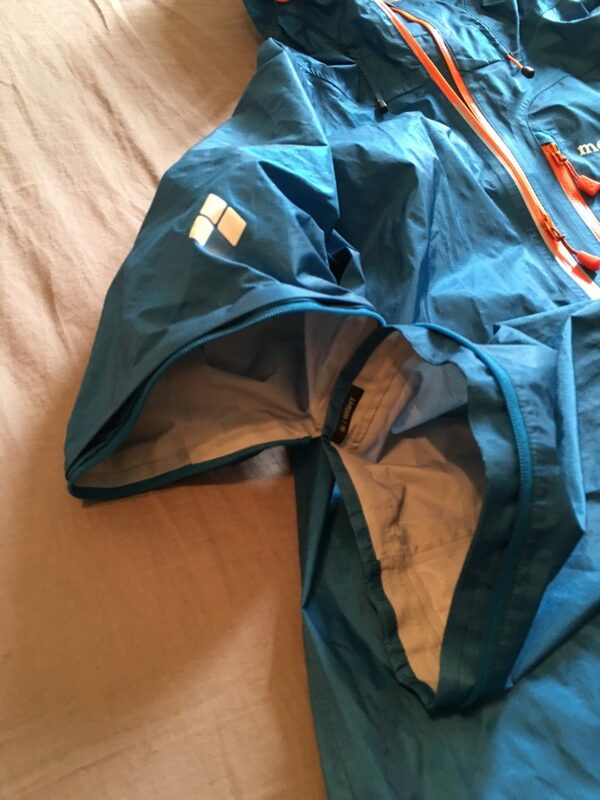 Bonus: I recently tested a new pair of running shorts with a built in liner on a 70-mile trek. After just a few hours, I learned that the liners plus external layer was resulting in way too much heat- which quickly resulted in chaffing. I hiked the last 50-miles using these Convertible Shorts, which were significantly cooler than the running shorts I was testing. If my only other alternative was full rain pants, I may have called it quits. 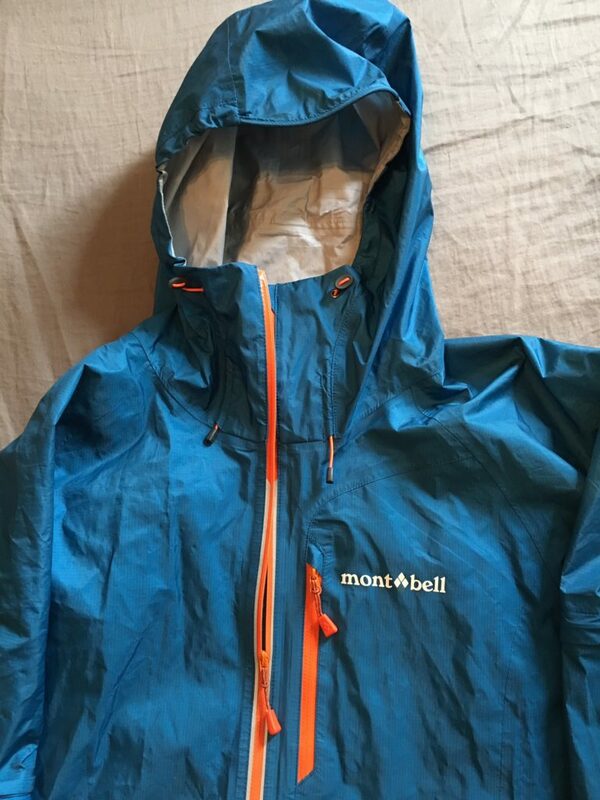 Although not ultralight, at just 9 and 6.1 ounces (respectively), Montbell’s Convertible Rain Jacket and Pants are definitely on the lighter end of the spectrum. This is especially impressive considering the extra weight of the zippers. These pieces are good at the things you need from a quality rain jacket, which is preventing the rain from getting in while still allowing internal moisture to get out. Although I’ve only had the opportunity to use these pieces for a handful of full days on the trail, which is not enough to speak to their efficacy over the long term, it performed brilliantly during this initial testing. I found both the jacket and pants to be very comfortable pieces. As stated above, fate forced my hand into trekking 50-consecutive hot miles with the convertible shorts recently, and I quickly forgot about the fact that I was even wearing rain gear. The pieces aren’t bulky or stiff, and don’t stick to your skin in humid environments. It’s painstakingly difficult to get the sleeves / lower-pant legs on once completely unzipped. Doing so without taking off the jacket and pants off is a skill I have to master. For this reason, I eventually learned to unzip each appendage 95% of the way, leaving the sleeves and pant legs hanging on by just a few teeth. This provided quite a bit of airflow, albeit far less than the full short sleeve / shorts version the piece is designed for. Presumably, during a warm summer’s rain, the short sleeve / shorts will provide enough coverage for comfort, rendering the need for the extensions unnecessary. If hiking through a cold rain, I consider hand pockets or rain mitts an absolute necessity. 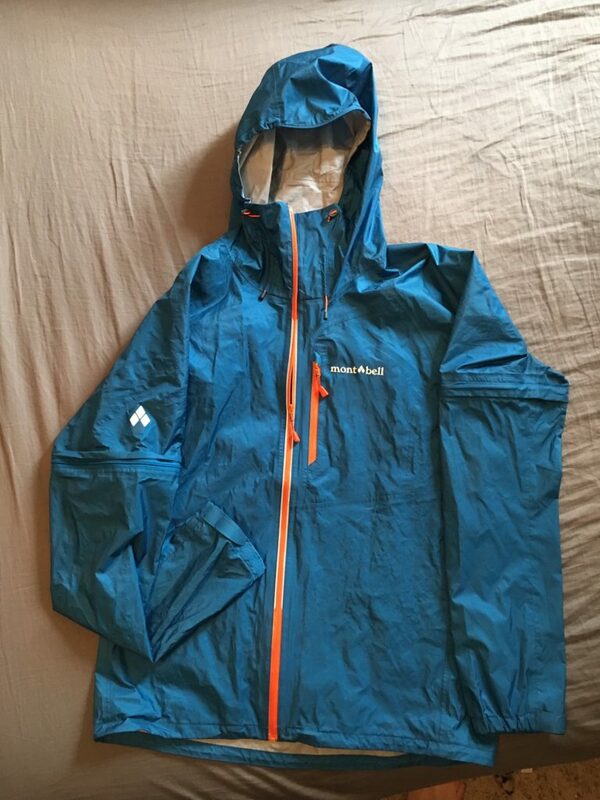 This jacket doesn’t have hand pockets (as is common for lightweight rain jackets), which requires the addition of rain mitts to one’s gear list in non-summer months (in my opinion, anyway). Again, bells and whistles such as hand pockets come at a cost, i.e. weight and price. You can find UL rain mitts (~1 ounce for a pair) at Z-packs and Mountain Laurel Designs, but this will set you back another $45 – $65. 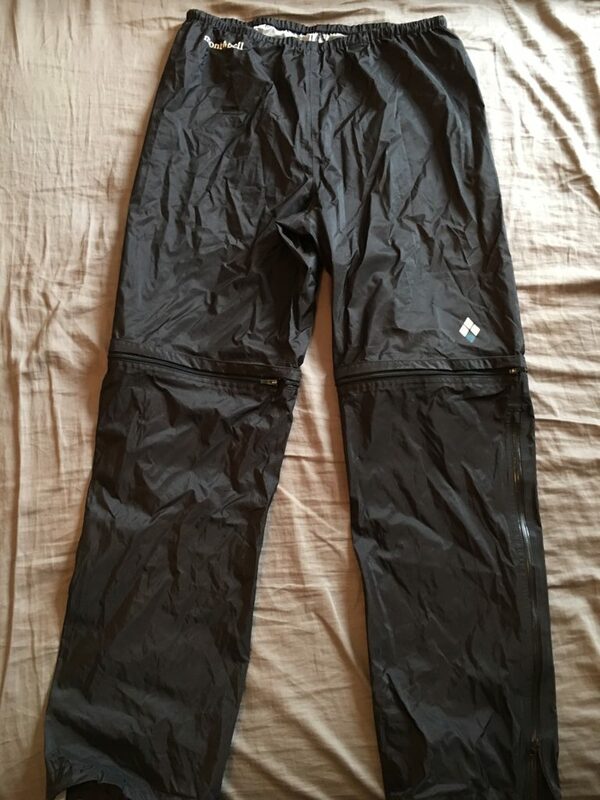 This a minor gripe, as I’d rather have a lightweight rain pant vs. one with pockets, but it’s worth noting for those who are used to having at least one pocket in their rain pant. 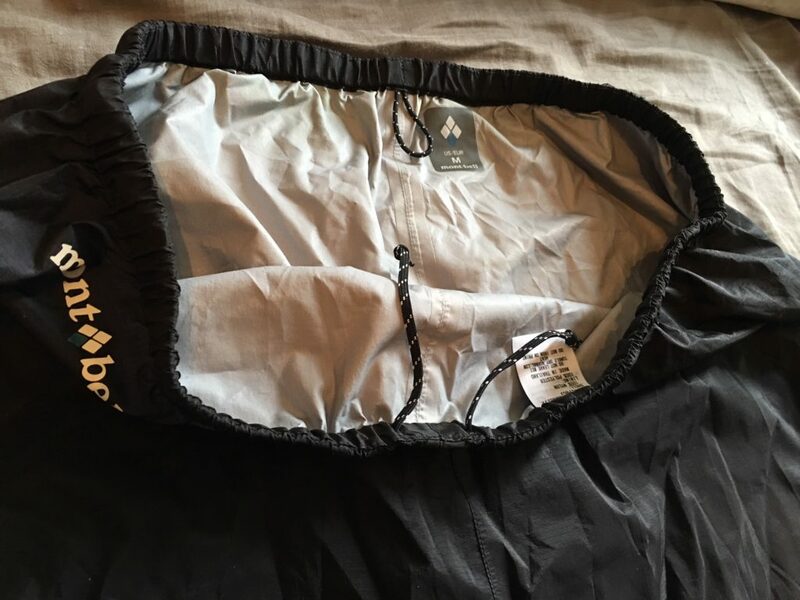 Put simply, I believe Montbell’s Convertible Rain Jacket and Montbell’s Convertible Rain Pants would be a great choice of rain gear for a thru-hike. The range of temperature control in these pieces is its standout feature- and for those who use their rain gear as town clothes, the ability to pare down to short-sleeves and shorts isn’t something to be overlooked or undervalued. At $179 for the jacket and $99 for the pants, these pieces are priced in the moderate-to-high end relative to other popular rain gear (after factoring in the additional cost for UL rain mitts, the price skews more toward the high end). If looking for a cheaper alternative, check out the Marmot PreCip (jacket and pants) or Frogg Toggs, but if you’re looking for a versatile, high performing, lightweight option for rain gear, you won’t be disappointed with Montbell’s new convertible options. Disclosure: the Montbell Convertible Rain Pants and Jacket were donated for the purpose of this review. Afterthought – with a DIY version you could also make a tougher lower leg for the pants for situations where you might be bushwhacking. You could swap out a lightweight or heavier lower leg option depending on the expected conditions, or leave them both at home in warm weather and just use the top to protect your shorts.